Tatsuo Miyajima‘s “Tatsuo Miyajima | Art in You” is held at Art Tower Mito Contemporary Art Center. This is his first solo show in 8 years in a Japanese metropolitan area. Thankfully, it’s showing a large number of his works. One of the symbols of this show is “HOTO”, a tower made of 3,827 of LED digital counters. HOTO, 2008. Courtesy of Shiraishi Contemporary Art Inc. and Lisson Gallery. Photo: Daici Ano, Courtesy of Art Tower Mito Contemporary Art Center. In a dark room, LED digital counters are organized in a straight and radiating red light. Surrounded by those lights, there is a small room created for one person which is completely dark. Miyajima’s major works are made with LED digital counters. One of the important works is “Death of Time”, 1992, a masterpiece dedicated to the tragedy that occurred in Hiroshima. He adopts numbers from 1 to 9 (except 0) to establish continuity, connection and eternity. And expresses life by indicating death. 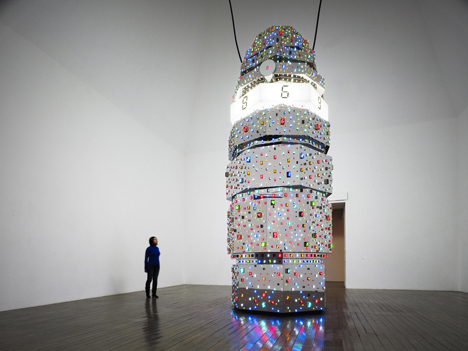 Tatsuo Miyajima is one of the most important artists in Japanese contemporary art, and highly regarded throughout the world. He was selected as a representative artist for the Japanese pavilion at Venice Biennale 1999 for his work ”Mega Death”. His main concept from the onset of his career has been about “Life”, and it hasn’t changed in this show. At the same time, we can see a change around Miyajima in this show. The most remarkable change is seen in “Counter skin”, the first photographic piece in his career. Miyajima photographed participants’ portraits at workshops held at Hokkaido, Nara, Hiroshima and Okinawa. While taking their pictures, he had conversation with each of them and took time to contact with them. At first, 8(a perfect shape in digital number) is painted on their body. Then, it is modified into a particular number and photographed in the place that they live. Painted on living human bodies, an inorganic digital numbers start to show up with full of life. “Death Clock” is completed by audience participation. “Counting in you” and “Changing time with changing self” take simpler approaches to involving the audience by using mirrors. 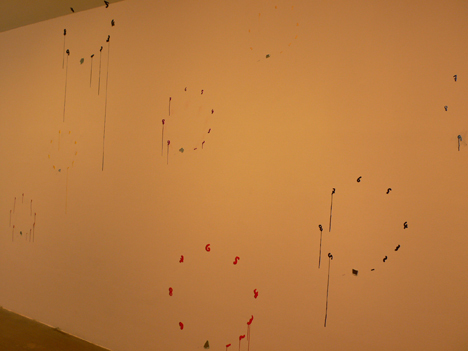 Emotional messages are attached to these works. These pieces are seen in contrast to the minimal LED digital counter works. His message hasn’t changed. His approach has. Miyajima has keeps proposing to the audience through his works. Then he spread his field to public art. But it wasn’t enough for him. Now he started to walk toward his audience, imagine and create with them in this real world. “Tatsuo Miyajima | Art in You” is showing his path. It is the documentary of Miyajima’s change. Miyajima’s approach is changing. Because he has found whom he should propose for. Miyajima says “I want to create for young people. I’m feeling it stronger year by year. I want to propose miracles about life”. In this show, many workshops have been held and a lot of students have participated. And in front of his works, countless people come and stop one after another to listen to his message. Sponsor : SHISEIDO Co., Ltd.